This article examines the prevalence of moderate and severe problem gambling in a sample of 254 incarcerated Canadian male federal offenders (completion rate of 39.0%). The prevalence of disordered gambling was measured using the PGSI, DSM-IV-TR, and SOGS that yielded estimates of 9.4%, 6.3%, and 13.0%, respectively. Severe problem gamblers were significantly more likely to have committed income producing offences, but were neither more nor less likely than other offenders to have committed violent offences. The majority of severe problem gamblers (65.2%) and a fifth of the moderate problem gamblers (20.0%) reported that their criminal activity was a result of their gambling (e.g., to pay off debts). Based on these findings there appears to be a need to offer problem gambling treatment services to offenders in order to help them break the cycle of gambling, debt and crime. This report was funded by a grant from the Ontario Problem Gambling Research Center. The project was reviewed by the CAMH ethics review board and approved as Protocol #238/2004 and renewed as #040/2006. The ideas expressed are those of the authors and do not necessarily reflect those of either the Ontario Problem Gambling Research Centre, the Centre for Addiction and Mental Health, or the Correctional Service of Canada. Cormier, R. (2005). Corrections and condition release statistical overview. Ottawa: Public Safety and Emergency Preparedness Canada. Cat No. PS1-3/2005E. Retrieved September 30, 2008 from http://ww2.ps-sp.gc.ca/publications/corrections/pdf/stats04/49569_Eng_finnal.pdf. Counter, A., & Davey, B. (2006). What is the Ontario Problem Gambling Helpline (OPGH)? Paper presented at the 2006 conference of the Responsible Gambling Council (Ontario), Toronto. Retrieved July 16, 2008 from http://www.rgco.org/articles/anne_counter_brad_davey_discovery_2006.pdf. Dimension Research, Inc. (2008). Confidence interval for proportion calculator. Retrieved October 1, 2008 from http://www.dimensionresearch.com/resources/calculators/conf_prop.html. Ferris, J., & Wynne, H. (2001). The Canadian Problem Gambling Index: Final report. Canadian Centre on Substance Abuse. Retrieved September 30, 2008 from www.gamblingresearch.org (search for Ferris). Statistics Canada. (2007). Adult and youth correctional services: Key indicators. The Daily, Wednesday, November 21, 2007. Ottawa: Statistics Canada. Retrieved March 3, 2008 from http://www.statcan.ca/Daily/English/071121/d071121b.htm. Urbanoski, K. A., & Rush, B. R. (2006). Characteristics of people seeking treatment for problem gambling in Ontario: Trends from 1998–2002. 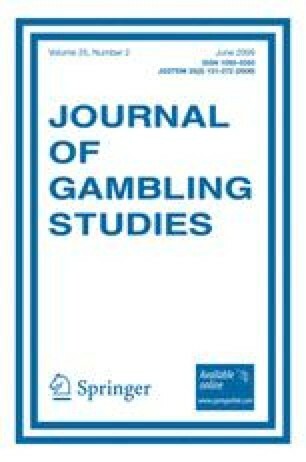 Electronic Journal of Gambling Issues, 16, 77–97 [Online]. Retrieved July 16, 2008 from http://www.camh.net/egambling/issue16. Williams, R. W., & Wood, R. (2004). The demographic sources of Ontario gaming revenue. Final Report to the Ontario problem gambling Research Centre. www.gamblingresearch.org [Search for Williams].